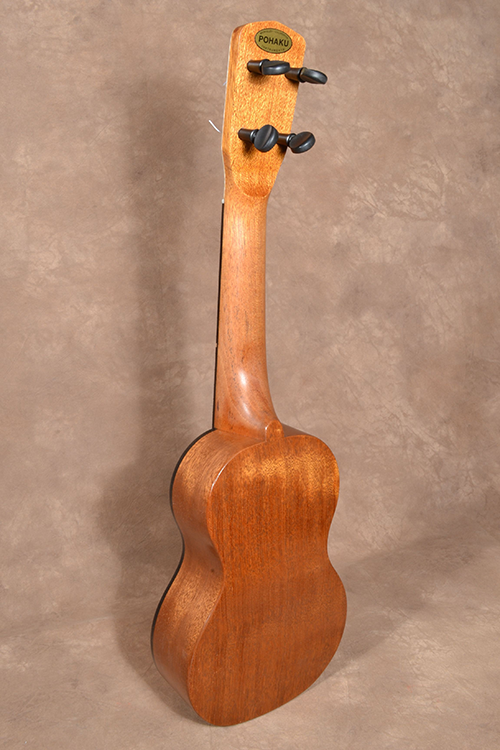 This is a new soprano size ukulele with a Honduran Mahogany body and neck. It has a Port Orford Cedar soundboard and ebony fingerboard. This bridge idea I have used a few times in the past and to compliment the bridge and top I inlaid simple maple fret markers into the ebony fingerboard, added a matching Maple peg head veneer and the body is bound in black. Overall the looks are simple and elegant and the Cedar soundboard makes a lively instrument with more mid and bass tone than a soprano would usually produce. Its loud, it plays easily and in tune with accurate intonation and a good set-up. The lacquer finish is slightly dull and not overly shiny yet it is smooth as silk. Its construction and attention to every detail is top notch as all Pohaku ukuleles are. The back is curved on both axis. The nut and saddle are bone and tuning is made easy with the planetary geared Peghed brand tuners. A hardshell case is included with the instrument. Overall length of this soprano is about 21” and its featherweight at just under 14 ozs.